Dulled concave and wavy tillage blades can be sharpened in the field with the new tool. 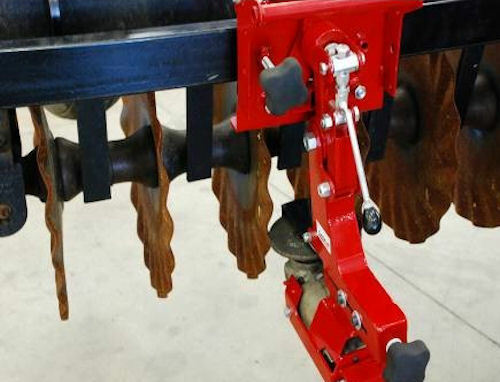 Case IH engineers say their 330 Turbo vertical tillage tool presented a problem: It worked well, but there was not a sharpener around to keep it in top shape after use. The answer, invent a sharpener! Voila! Meet the Case IH Robo-Sharpener, a system that will sharpen a Case Turbo blade in only a few minutes. Sharpen wavy blades in the field with Case IH's new robo-sharpener. The sharpener is equipped with a trolley system that allows it to roll along a rail from blade to blade as the operator watches. The system, being attached to the implement, does not require level ground so sharpening can be done in the field, the shop or the yard. It also works on standard concavity disk blades and provides a restored cutting edge that can slice through residue and hard soil. The Robo-Sharpener is designed to turn the blades with a gang-driver at just the right speed to provide a good edge without overheating the blade being sharpened. Resharpening can save up to 85% of the cost of reblading an implement, and with the Robo-Sharpener, blades can be resharpened multiple times. For more information, visit www.caseih.com.